We continued our focus on the letter "g" by looking at goats. Carisa over at 1+1+1=1 has some great printables to go along with this theme. Head on over there and check them out! This is a classic retelling of the Norwegian folk tale by an award-winning illustrator. Galdone's illustrations do the story justice- lively realistic looking billy goats and, of course, an ugly troll. The troll is frightening, but not overly so. The story lends itself well to dramatization-- I really enjoyed hearing my husband read this out loud to Jonathan. Jonathan has enjoyed this story and requested it several times. It's a great imaginative fairy tale! This is a fun story that Jonathan really enjoyed. Jonathan liked the catchy, rhyming text as well as the bold cartoon-like illustrations. The goats are portrayed in different settings and different activities- from city goats running to show-off goats playing on a playground to firemen goats climbing. The number of goats increases from one to ten as children are invited to count the silly goats. A very cute and creative counting book. 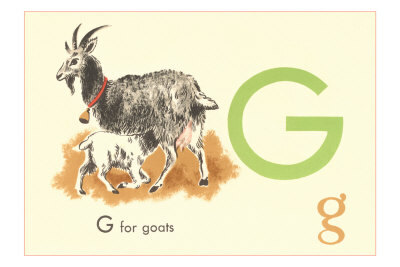 We also read an goat-themed alphabet book. Polacco's charming illustrations feature little shepherd girls and their lively, delightful goats. The book covers everything goat-related from apples to three little kids named Zig, Zag and Zoe. It's a fun and different approach to the alphabet. Jonathan and I enjoyed a nice quiet moment snuggling with this book. Pretend Play: We pulled out our Little People farm (which included a goat) and played a bit with that. Art : We used a lot of Carisa's printables. We colored goats using crayons, markers, and colored pencils. Field Trip: We did not get to do this because it was too hot that day, but I had planned to take Jonathan over to a local petting zoo and pet some goats and see some geese. I think we still may try to fit this in sometime soon!